The Justice League is no more! Instead the Crime Syndicate from Earth-3 in the multiverse have managed to “kill” most of the heroes and round up all the villains, so as to take over the world. 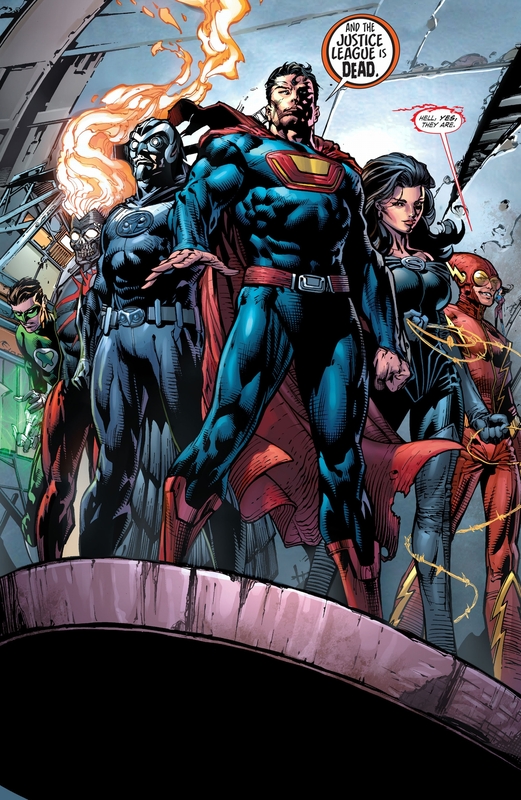 The Crime Syndicate consists of doppelgangers Ultraman (Superman), Super Woman (Wonder Woman), Owlman (Batman), Power Ring (Green Lantern), Deathstorm (Firestorm), Johnny Quick (The Flash) and Atomica (Atom) with their Sea King (Aquaman) not surviving the trip over. After busting dozens of villains out of jail, this group of seven demand obedience from the motley group in front of them. They explain that the strongest should survive, and the way the former heroes have been protecting the weak of the planet was wrong. Ultraman declares “Aeternus Malum”, which roughly translates to forever evil, to his new army. Thrilled to be allowed to act on their base instincts, this new secret society go out and create deadly chaos all over the world. But not all is well within the crime syndicate. The seven argue endlessly among themselves, and fear that the creature that destroyed their previous world will find them here. We discover Super Woman is pregnant and secretly telling both Ultraman and Owlman that they are the father, so we know she is planning on playing them off one another in the future. In the midst of the lawlessness and disorder, Lex Luthor takes stock of the situation and takes action. He has a powerful secret weapon that he had been working on for years, and puts it into play. We also discover that not everyone from the Justice League is gone. A certain someone, who often fights dark impulses (you have to know who I’m referring to! ), joins forces with Lex and some other surprising villains to take down the syndicate. The conclusion reveals who the mole in the Justice League was to allow the syndicate to take over, and Super Woman has another surprising disclosure. This was an extremely dense story, one that took me time to go through. While I have been reading more DC graphic novels recently, I still had to look up many characters to find out their backgrounds and how they connect into one another. There were some inconsistencies and some holes in the story that were distracting, but I felt as a whole, it was a very strong story. It made me think- can someone who has been evil for a long time, change? Does his/her new good actions erase all the bad they have done in the past? On the flip side, can someone who has been good but then makes a horrible choice, does that negate their past good deeds? The artwork was fantastic. It took real skill to illustrate the 100 or so characters in the story. There was an amazing four page spread of the syndicate with the villains surrounding them, that I wish had been a pull out, so we could see the whole cast of characters at once. Despite this four page spread, there were hardly any other two page spreads, but there were occasionally one page panels. With black borders, the rich coloring stood out, and every panel was drawn with precision. This New 52 crossover event was definitely successful. Not only was it a fun read, but the ending leaves some open story lines that can be built upon in the future. I’m definitely interested in knowing what awaits the villains that survived and how that will affect the Justice League in the future. Johns, Geoff, Davis Finch & Richard Friend. Forever Evil. 2014. I'm a busy mom and teen librarian! I manage to fit in some time to be the co-writer of the blog Graphic Novelty². Thanks Nancy, my job trying to keep up with (or rather catch up with) comic book characters just got a whole lot harder! A new raft of characters to read up on?….Oh well I have next year to start on my reading. And on the topic of new years, I hope you have a great 2018! If you are a big DC fan, it will be a treat! I’m going to sound like a heretic (probably) but I am going to be reading up on comics from both camps to assist in my designing! Reading this blog will be a big help, so thanks in advance. I remember reading this as it came out. I kept having to re-read previous issues to keep up with the story. It was confusing and complicated, but over all enjoyable. I don’t remember very many details anymore. It was complicated at times! I don’t read a lot of DC comics, so some character connections eluded me. I’m pretty versed in dc, when it comes to information like that, but I was lost at times too. They reworked some things for the new 52 and revealed some new connections during forever evil. It was interesting. I stopped reading avidly not to long after, so I’m not really sure what those connections came to later on. Given how you have been challenging yourself to read more DC, you kind of make me think I should too. You know I’m a Marvel and IDW guy, through and through, but maybe I should give a little time to DC….hmm. While I don’t really read much individual superhero DC books, some of their event or crossover books have really been excellent. Kingdom Come, Superman: American Alien, and Red Son have been so so good! I actually think of your reviews on those comics whenever I’m in the comic shop. You’ve made them sound so exciting! Sooner or later I’ll take the jump :). Who knows?? Maybe 2018 will see some growing diversity in my comic options!